Super Hot!!! Today, B&H has a great deal on Mitakon Zhongyi 20mm f/2 4.5x Super Macro Lens for only $139, available for Canon EF/ Nikon F mounts. This is $60 cheaper than regular. Designed for full-frame Canon EF-mount DSLRs, this lens can also be used with APS-C-format models, and will provide a 30-32mm equivalent focal length. 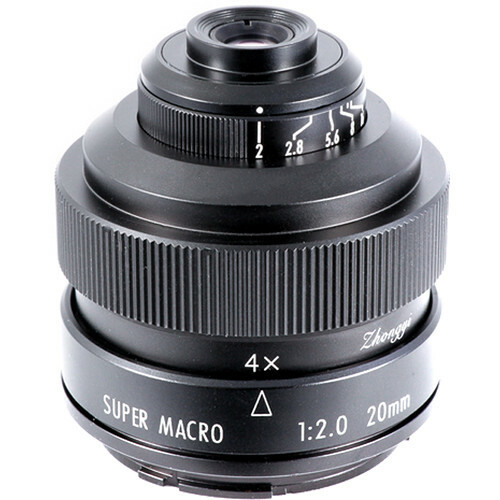 Specialized super macro lens is designed for working with close-up subjects and provides a maximum magnification of 4.5x and a minimum magnification of 4.0x. Minimum working distance (distance from front of lens to subject) is 0.8″; the lens does not offer infinity focus. Manual focus control for fine-tuning focus position and a manually adjustable aperture ranges from f/2 to f/16 for adjusting exposure and depth of field. Six elements in four groups optical design provides consistent edge-to-edge sharpness and illumination. Wide-angle focal length pairs with the high magnification range for producing dynamic compositions. Metal lens barrel is both rigid and durable.